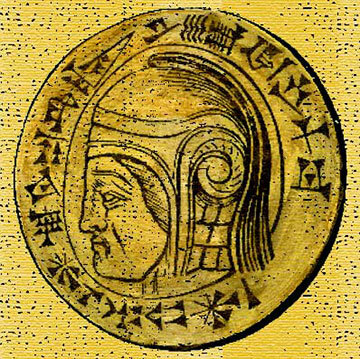 It was the twelfth year of the reign of Nebuchadnezzar, king of the Assyrians in the great city of Nineveh. At that time Arphaxad ruled over the Medes in Ecbatana. Around this city he built a wall of blocks of stone, each six feet in height and twelve in length. He made the wall 140 feet high and 100 thick. At the gates he raised towers of 200 feet, with a thickness of 120 feet at the base. The gateway he built to a height of 140 feet, with an opening 80 feet wide for the passage of his chariot forces and the marshaling of his infantry. Then King Nebuchadnezzar waged war against King Arphaxad in the vast plain, in the district of Ragae. To him there rallied all the inhabitants of the mountain region, all who dwelt along the Euphrates, the Tigris, and the Hydaspes, and King Arioch of the Elamites, in the plain. Thus many nations came together to resist the people of Cheleoud. Now Nebuchadnezzar, king of the Assyrians, sent messengers to all the inhabitants of Persia, and to all those who dwelt in the West: to the inhabitants of Cilicia and Damascus, Lebanon and Anti-Lebanon, to all who dwelt along the seacoast, to the peoples of Carmel, Gilead, Upper Galilee, and the vast plain of Esdraelon, to all those in Samaria and its cities, and west of the Jordan as far as Jerusalem, Bethany, Chelous, Kadesh, and the River of Egypt; to Tahpanhes, Raamses, all the land of Goshen, Tanis, Memphis and beyond, and to all the inhabitants of Egypt as far as the borders of Ethiopia. But the inhabitants of all that land disregarded the summons of Nebuchadnezzar, king of the Assyrians, and would not go with him to the war. They were not afraid of him but regarded him as a lone individual opposed to them, and turned away his envoys empty-handed, in disgrace. Then Nebuchadnezzar fell into a violent rage against all that land, and swore by his throne and his kingdom that he would avenge himself on all the territories of Cilicia and Damascus and Syria, and also destroy with his sword all the inhabitants of Moab, Ammon, the whole of Judea, and those living anywhere in Egypt as far as the borders of the two seas. In the seventeenth year he proceeded with his army against King Arphaxad, and was victorious in his campaign. He routed the whole force of Arphaxad, his entire cavalry and all his chariots, and took possession of his cities. He pressed on to Ecbatana and took its towers, sacked its marketplaces, and turned its glory into shame. Arphaxad himself he overtook in the mountains of Ragae, ran him through with spears, and utterly destroyed him. Then he returned home with all his numerous, motley horde of warriors; and there he and his army relaxed and feasted for a hundred and twenty days. Judith is a book of the Apocrypha. Traditionally and in general, Jews and Protestants consider it acceptable to read and learn from, but do not consider it the word of God, i.e. it is not "canonical". On the other hand, it is canonical in the (Roman) Catholic Church and the Orthodox Church. But all scholars agree, it is an absorbing and possibly true tale. Some Protestants have called it the "first historical novel". Among the pantheon of great conquerors — Julius Caesar, Alexander the Great, Genghis Khan, etc. — Nebuchadnezzar has gotten completely lost. For one thing, his name is so hard to pronounce! But I suggest you take a minute and learn his name, so that it trips off your tongue (at least inside your head) without any difficulty. We are going to be reading about him the next week or two, and you will want to be completely comfortable with the name. If it helps at all, there was once a silly riddle that my father taught me: "Nebuchadnezzar, King of the Jews, spell it with two letters, I'll give you my shoes." The beginning of Judith's story shows a local king who has enormous drive and ambition, and creates a great walled city in Assyria, an area which would roughly correspond to Iraq on today's globe. The time is roughly 600 B.C. Anyone who has seen, or has read or watched much about, the pyramids of Egypt, knows the enormous feat that building a stone wall 100 feet thick and 140 feet high entailed in the ancient world. Still, nobody paid much attention to this upstart. The Assyrian Empire was long defunct as a great power. He got no respect; and so, like many such men in history, he went out and seized the respect he needed by fighting and destroying his neighbors. The passage ends as he returns home, having captured his enemies' soldiers to use in his own army, and relaxes while his new, elevated position in the world sinks in. P.S. If you didn't get it, the answer to the riddle is "i-t".